Frieda Loves Bread: Frozen Hashbrowns or Shredded Cheese? 6 Frozen Hashbrowns or Shredded Cheese? One night, while I was out of town, my husband called me to tell me what he made for dinner. (Isn't that great? He actually cooks while I'm gone!) He opened the large, unmarked brown bag and was thrilled to see that it contained shredded mozzarella cheese in it. He sprinkled it on his dish and put it in the oven to allow the cheese to melt. He waited.......and waited....The cheese began to brown, but it did not melt. Hmmmm....that's odd, he thought to himself. Then he took a big bite. 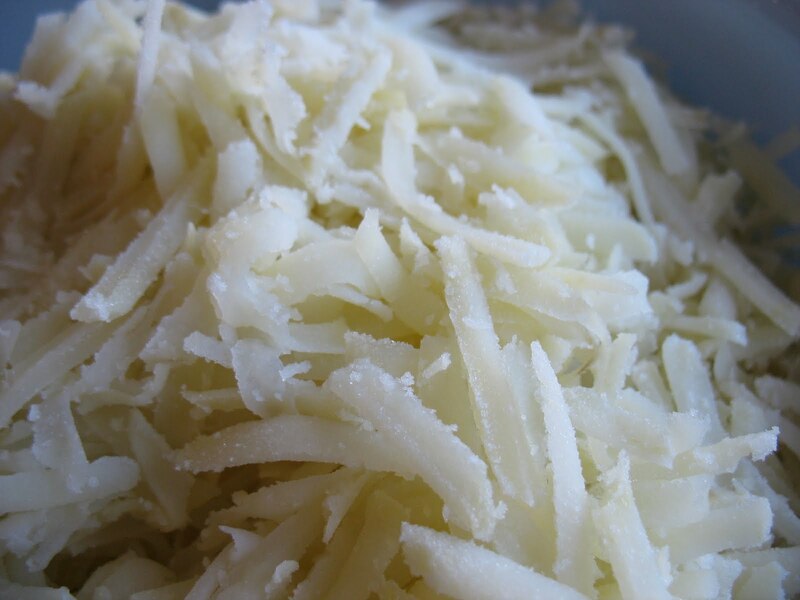 That's NOT cheese....it's shredded potatoes! I had such a good laugh! I would have done the SAME thing! Last summer, I got a killer deal on potatoes. I bought 50 pounds of Russetts, 50 pounds of Yukon Golds, and 25 pounds of reds. During the winter, I bottled some of the Golds and reds (post to come soon!). I kept my potatoes in their original mesh sack and hung them from the ceiling in my basement storage. Potatoes are to be stored in a cool, dry environment with good ventilation in temps between 45-55 degrees F.
Even in these conditions, my taters began to sprout. My boys did NOT like seeing these alien looking potatoes ~ Sprouted potatoes are fine to eat as long as the sprouts are broken off and the potato has not shrunk in size. If the potato is soft and mushy....throw it out! 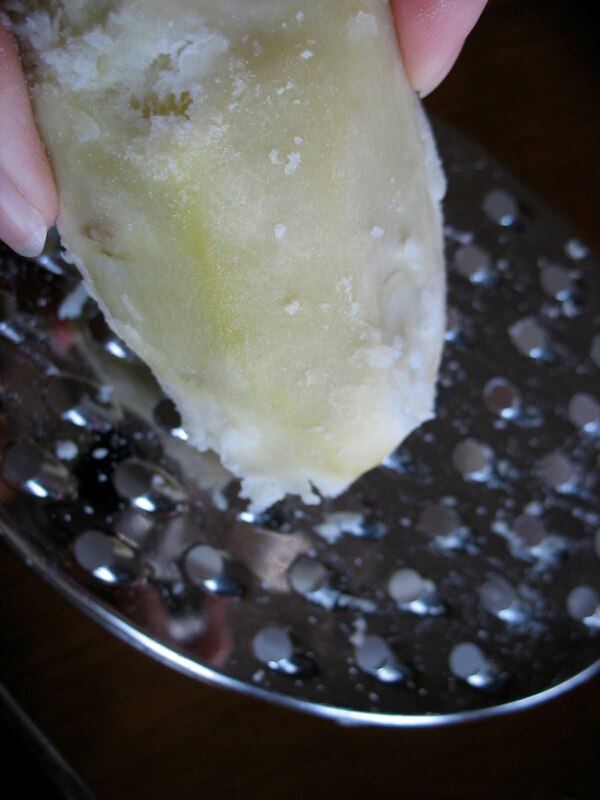 Raw potatoes do NOT freeze well. They will turn black. I peeled my potatoes, rinsed them, and put them in a large pot to boil. I left the potatoes whole and boiled them for about 20 minutes, or until I could barely stick a fork in them. (These were medium potatoes; larger ones will take longer to cook). I did NOT want to cook them all the way through, as I wanted them to be firm enough to shred. Plus, I was planning to freeze and re-cook the potatoes as hasbrowns. I put 2 cups of shredded potatoes in a freezer quart sized bag, dated and labeled it. How did they cook up? Now there's no question it's frozen hashbrowns! Oh, that brings back memories! I've done that, and I'll tell you - we didn't look at mozzarella cheese the same way for a long time! Love your idea for making your own frozen hash browns! That's too funny! I've never made hash browns. Thanks for the idea! What a great idea! I'm bookmarking this to use next fall after I stock up on potatoes. I could see this happening in our house, except my husband would have eaten the 'cheese' directly... That would have been a great face! Oh Frieda what a great post! I make hash brown casserole ALL the time but I've never had any success using anything but the store-bought frozen hash browns. That's so funny. My husband actually did the same thing once. Luckily I caught him before he had dumped a ton of shredded hashbrowns into what was going to be baked ziti. They do look surprisingly the same.